Scamp has a record number of watertight compartment. These double as storage areas. Making watertight doors is a challenge. There are many commercial units available but they tend to be plastic and expensive. 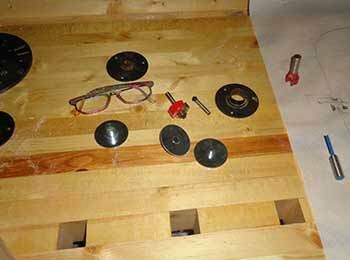 Before I install bulkhead 3 and the mast case, I have to decide on how I am going to access the front compartment. It's a water tight area so the access doors need to be waterproof. I also need to decide the size and position of the doors. There are many nice ready made doors available but they are a bit expensive and I am building as economically as I can. No compromise in the essential material but no luxury either. Part of my problem is shipping is expensive and the exchange rate is terrible right now. It makes us competitive when we are selling stuff but buying is harder. There is often duty at the border as well. The trade off is always time vs convenience. 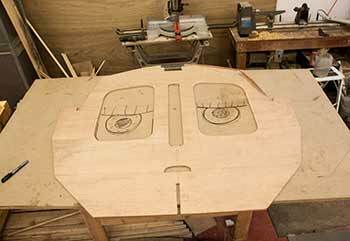 Many people have made nice plywood hatches that work adequatly and Small Craft Advisor used to offer a nice kit for doors. I'm not sure if they still do. 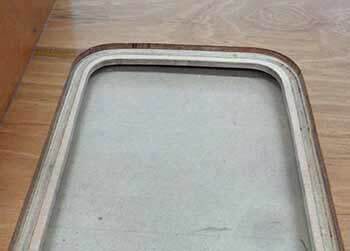 I expect I will make some plywood doors, at least for the front compartment and decide about the other doors after I see how well they work, or not. 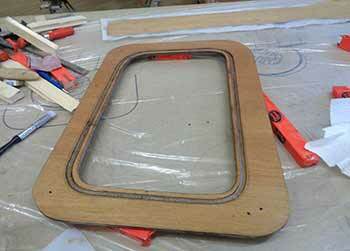 I decided to make the opening in the scamp bulkhead 3 using a template and router. The set up is time consuming but then cutting is fast and accurate. Since there are several layers to cut plus the door and its opening, it does not take any longer. First step is to draw the opening. I'm using a piece of melamine I have left over. In hindsight the melanine cover chipped and was annoying to sand and finish. I drafted the opening onto the board. I cut the opening with a jig saw and cleaned it up with rasp and sandpaper. 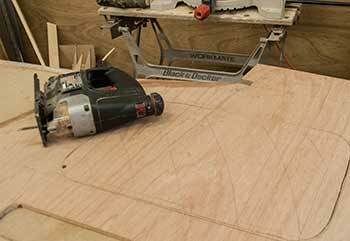 This will be my pattern when it comes to cutting the actual plywood. After digging up all my router bits and pieces I figured out what I could do. I have a flush bit that will cut exactly the same size as the opening and I have some pattern cutting collars that can make the opening smaller. I had inherited them from a garage sale I think so I had no idea if all the parts were there. I have never used a pattern cutting collar set up before either. I figured out that I needed a second pattern that was smaller and that was easy to cut out using a collar. 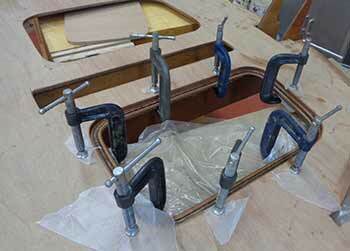 What took some time was making a new router baseplate that could fit the collars. 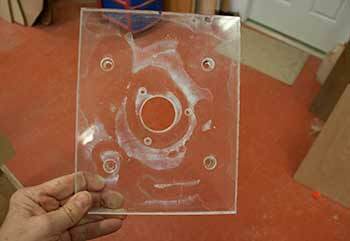 I had some old lexan from a sign and I used two thicknesses of this to make a base-plate. They went together nicely with superglue. The hardest part was figuring out how to centre the collar in the plate. 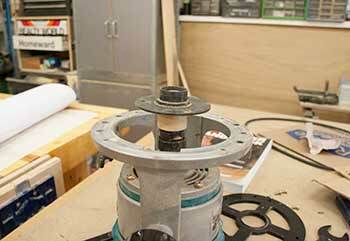 Eventually I turned a little holder in the lathe, it holds the collar centered it in the chuck of the router, The top part is cone shape. All I have to do is put the little jig in the router, put the collar on the cone and it is centered. I was able to mark the screw holes and drill them. The purpose of the collar is to distance the blade from the edge of the pattern. This allows an opening that is smaller than the pattern. I had screwed the first pattern onto a piece of plywood so they would not slip out of alignment. Here I have made a second pattern using my first one. 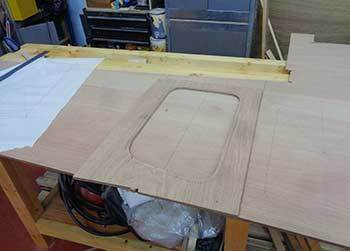 This second pattern will be used to cut supporting pieces that fit under the opening and support waterproof gaskets. 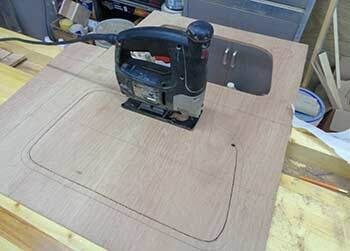 To cut the bulkhead opening it was a simple matter of lining up the pattern and marking the cut, making a rough cut with the jig saw. 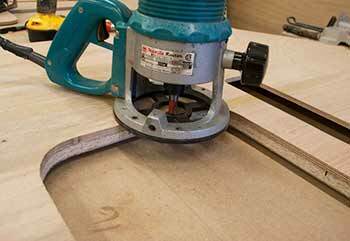 It makes the router cut much simpler if most of the material is removed with the saw. 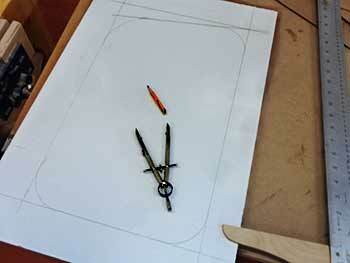 Then using a flush cut bit to go around the pattern and tidied up the opening. As long as the pattern is good, the opening is good. I flipped the pattern over, marked, rough cut and routed the opening cleanly. 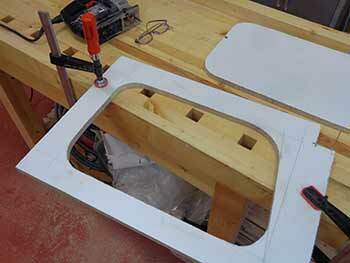 The openings to bulkhead 3 are done and took no time at all to make once everything was set up and the patterns made. I will be able to cut doors and backing pieces using combinations of bits and collars and these will be fast to cut too. I had cut the opening using templates, but I now need to prepare a liner to give a lip and to stiffen the board. I'm not re inventing the wheel here. Several people have made variations on this theme and I found an old description for much the same design on a Kayak website. Small craft advisor used to sell something like this as well. After figuring out what combination of collar and router bit will give me the best size for the lining piece, I marked it on some plywood. I used one of my templates. Luckily I had ordered an extra sheet of plywood. I fully expected to have to recut some pieces. I was lucky and the piece turned out to be extra. I marked the opening and cut it out just a little larger. I've marked 2 liners on one sheet of ply and will separate them after. 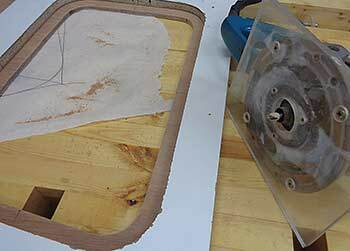 After cleaning up the opening of the lining piece I got the router ready to cut a shallow slot to hold the rubber sealant ring. I have not solved what to use yet. 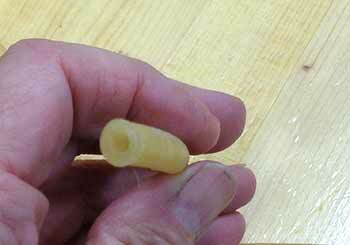 I found a really nice foam rubber sealant tube. It's in Ontario and it's the right size. Unfortunately they only sell it in huge quantities. I'll figure something out. It seems to fit quite well. It's actually going to go on the other face of the bulkhead but I did not want to disturb the mast case. It will need some sanding. My plywood is very brittle and the router bit I used is a cheap and nasty bit I got in a promo kit. I certainly got my money's worth with it but now I either have to try and sharpen it or replace it. While I'm sanding I'll round the edges some. I made a curved slot rather than a square slot because I did not have a narrow enough square cutter. That commits me to finding a round seal rather than a flat seal. 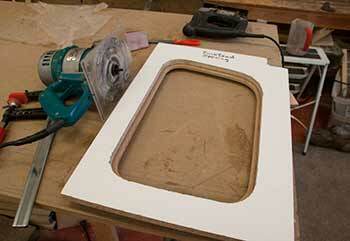 I spent quite a lot of time sanding and getting the liner piece for the front compartment opening ready. I had a bit of patching to do because the plywood had split some. It's very hard and brittle and splinters constantly. It's meranti. I glued it to the bulkhead. It lined up better than I expected. It's one of these things that are completely hidden so as long as they are solid and do the job good enough will do. I positioned it pretty much by eye. Temporary screws hold it. A coating of resin then thickened epoxy to glue it in place. I added some extra clamps and cleaned up excess. It seems ok. 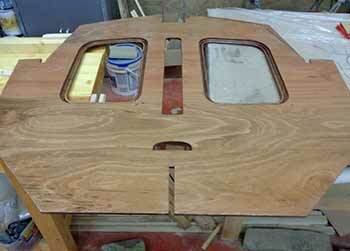 The second opening liner is glued in. The bulkhead is feeling quite stiff and solid now. 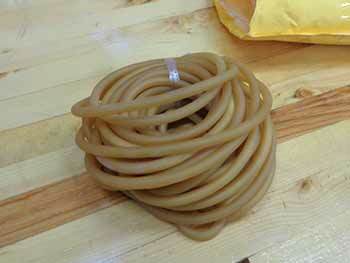 I found a supplier of latex tubing with really thick walls. The size is just right to be a seal. They are shipping to me. Tubing came today. It's going to work just fine. I have to figure out a way of gluing it to itself to make a ring. I'll try rubber cement, superglue and the 3M 5200. One of these should work. I also have liquid latex so that might be a good glue too. I was reading online from a company that sells door seals and in particular a foam tube. This would have worked very well but the smallest quantity was 500 feet. They said in the installation instructions that it's better not to squish the tubing too much. You get a better seal that way. Scrounged around for suitable glues. Some 4200 3M sealant, another sealant Elastomeric, a rubber cement, a superglue and a bike patch kit glue. My latex liquid was dried up. I might also try silicone sealant if these don't work. All it has to do is keep the ends together as the tube gets squished by the door. I used a couple of pieces of black tape to temporarily clamp the sealants. Other glues did not need to be clamped to stay together. After 24 hours I have 3 winners. The 3M 4200, the crazy glue and the rubber tire patch kit glue all stuck the ends solidly. They would all work. I guess latex is not too hard to glue. I can now make my seals.